It’s hard to believe this was my second to last mountain bike race of the season, and last (mtb) race in Illinois– this year has gone by far too quickly! I was pretty sore and beat up from Saturday’s crash and was worried how this race would go. First place in the series was locked up by Beverly long ago, but Melinda and I were still battling it out for 2nd place. The drive took slightly longer than anticipated and we were only able to pre-ride the first mile and a half of the start and a little bit of the finishing section. I was definitely at a disadvantage for not knowing these trails; they were very technical and have some features that I needed to practice! At the start line we debated between how many laps we were to do. The flyer had us doing 3 laps, which would be the same as the men, but another place had us listed as doing 2 laps. I was all in favor of 2 laps since I raced the day before! We voted and since it was not unanimous, we had to stick with the 3 laps per the race flier – meaning we would race about 24 miles, yikes! I took the lead on the start, hoping to get a gap, but we all stuck together. I really should have grabbed a wheel instead, but I’ve been working so hard to not be timid and get a good start, that holding back went against everything I’ve tried to accomplish this year with my starts. I still have so much to learn about race strategy! Back to the race though – We made it to a steep downhill followed by a steep rocky climb which I wasn’t quite prepared for, but luckily Beverly warned me about it ahead of time – thank you! I didn’t quite make it up and Bev took the lead. I was thankful to have a wheel to follow since I had no idea what to expect with the very tight and twisty trails. There was a crazy dip section with about 8 dips – the kind with very narrow bottoms that you had to be extremely careful on (I’m sure these have a name!). We made it through those without incident and in and out of a couple more singletrack sections. We went into one single track section and I had no idea what was coming up and found myself headed for a long and winding skinny (I also had no idea there was an option to go around – this is where pre-riding would have been helpful!). I didn’t make it and got passed by pretty much everyone – crap! We had started behind the Comp Class and Sport Men. The Sport Women started with us. There was a junior boy in the sport race and a sport girl that everyone else had managed to get around before bombing down a fast decent that led into another off camber decent. There was a crash and I got stuck behind it. I managed to eventually catch up to Melinda, but Rachel and Bev were long gone. After a while I was able to make a pass. I had a little gap that was squashed once we made it to a skinny up and over that was about 3 ft high and 4 inches wide. Did I mention I was still shaken up from Saturday’s crash? Of course I completely messed it up. Melinda got ahead again for a while, and then I took the lead again in an open section. If I’m remembering correctly, I finished the first lap with an ever so slight gap to 4th place. I made it through the first section of singletrack, up the climb up to the dam and down the gravel road to the main area of singletrack. I finally came upon another one of those darn skinny up and overs and just dismounted to climb over. I was caught and at the next one I got to I was passed since I couldn’t/wouldn’t ride it. There were three of these and I kept losing time at each one. I feel really stupid looking back for not riding them. I have to work on that for next season. Needless to say, I never was able to catch up on the third lap and finished in 4th. I was pretty disappointed, but had to keep reminding myself that this was my second mtb race of the weekend and with having a bad crash I should just be proud to have gone back out and raced the next day. My disappointed was short lived once I put it into perspective, and I just have to say that I’ve had an incredible time racing in Illinois this year! I’ve gotten to know some of the race organizers, officials, and regular racers and have to give a shout out to Tony, Amy, Bev, Melinda, and Rachel for being so awesome. Everyone has been so nice, friendly, and welcoming, and I already can’t wait to see them all again next year! Melinda 2nd, Beverly 1st, Me 3rd. 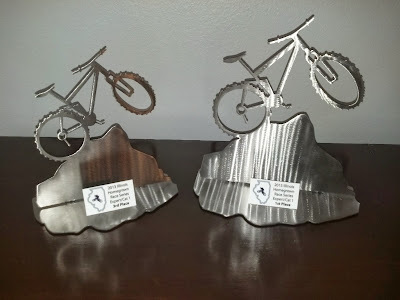 These are the the best trophies ever!!!!!! !